time, place, and environmental circumstances, and these two patterns are not mutually exclusive. The interaction between grazers and periphy-ton has been studied using a variety of experimental approaches, including laboratory streams and field experiments (Lamberti et al. 2006). The former have the advantage of experimental control, allowing manipulation of grazer densities and species, the point in time within algal succession when grazers are introduced, and envi ronmental variables such as light and nutrients. Field experiments offer less experimental control but more natural conditions. One approach has been to position tiles colonized with benthic algae on raised platforms, thus restricting access by all grazers in some instances, or at least of those with poor swimming and dispersal ability. Enclosures placed on the streambed allow even greater control and can easily be placed in sunny versus shaded environments or stocked with different species and size classes, although altered flows and increased sedimentation can result in unwanted side effects. Small squares or hoops supplied with electric current often are effective in excluding larger herbivores including fishes, tadpoles, and shrimp, and avoid the undesirable side effects of cages. Laboratory streams were inoculated with algal scrapings, consumers were added at approximately natural densities 9 days later, and development of the periphyton mat was monitored for 48 days. The effect of the mayfly was slight and confined to small (<2 cm diameter) patches, but Juga had a substantial impact and Dicosmoe-cus even more so. However, other studies have found that grazing mayflies are able to limit ben-thic algae. An experiment that enclosed the mayfly Ameletus at realistic densities in Plexiglas chambers containing natural streambed material resulted in marked reductions in periphyton standing crops, even at densities of 0.5 x ambient (Hill and Knight 1987, Figure 9 3). It is also possible that entire guilds of herbivorous invertebrates have a significant effect in the aggregate, but this may be difficult to establish from studies of individual species. 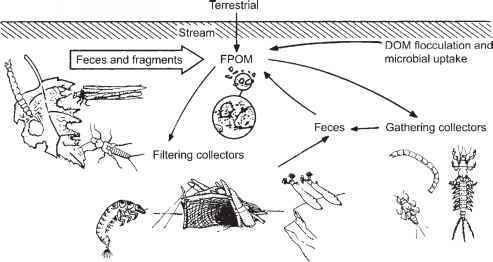 When all herbivorous invertebrates in a 50 m2 reach of a Colorado mountain stream were reduced by daily electroshocking with a portable apparatus typically used to collect fish, algal biomass increased substantially in comparison to a reference stream (Taylor et al. 2002). Where herbivorous fish are plentiful, they have been found to exert considerable control over benthic primary producers. 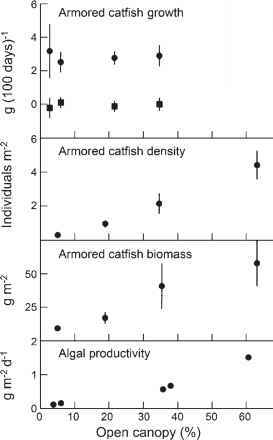 Exclusion of the stoneroller minnow Campostoma (due to the presence of a piscivorous fish) resulted in growth of filamentous algae, whereas introduced Campostoma caused rapid declines in algal biomass (Power and Matthews 1983). Tropical streams often contain numerous species of grazing fish, as well as algivorous insects, mol-lusks, crustaceans, and larval amphibians. browsing the loosely attached, outer layers of the periphyton mat, whereas the scraping and rasping mouthparts of caddis larvae and snails allow them to consume tightly attached algae. Filamentous algae appear to escape most invertebrate grazers due to their size and texture, although probably they are consumed in their early growth stages (Dudley and D'Antonio 1991). However, algal filaments can be very vulnerable to grazing fishes such as the stoneroller in temperate streams and a variety of herbivorous fishes in tropical streams. One effect apparent in virtually all experimental exclusions of herbivorous invertebrates is a reduction in large, loose, or overstory components of the benthic algal assemblage and an increase in the relative proportion of small, tightly adherent cells (Steinman 1996). Increases in filamentous green and blue-green algae also may occur, as well as changes in particular species. Steinman et al. (1987) provide a particularly detailed account of changes in the algal assemblage in laboratory streams in response to four densities of Juga and Dicosmoecus. Ungrazed streams developed thick periphyton mats during the 32-day study. Rosettes of Synedra and aggregates of Characium became established first, then the assemblage became more heterogeneous as patches of other diatoms developed (Scenedes-mus, Achnanthes, Nitzschia), followed by the filamentous green alga Stigeoclonium tenue and the blue-green alga Phormidium uncinatum. Grazing caused severe reductions in Characium, whose dense aggregations apparently made it vulnerable, and in Scenedesmus. In contrast, Achnanthes lanceolata and S. tenue increased in representation under herbivory, the former because it is adnate, the latter because its prostrate basal cells are little grazed and possibly benefit from removal of overstory cells. Which components of the periphyton mat are most affected by herbivory can vary with the species of grazer and their feeding mode. The snail and the caddisfly just described caused broadly similar changes to benthic algal assemblages. However, it also is possible for two herbivores to have quite different effects, as Hill and Knight (1987, 1988) demonstrated in their comparison of the caddis Neophylax and the mayfly Ameletus. Loose and adnate layers were sampled separately and Ameletus affected principally the former, causing declines in motile diatoms including Surirella spiralis and several species of Nitzschia. Neophylax affected both layers but its major impact was through reducing the abun dance of a particularly large, adnate diatom that comprised the bulk of total periphyton biovolume. 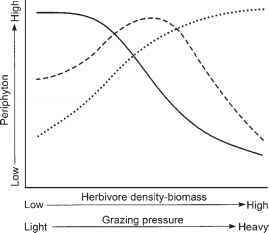 Primary production on an areal basis usually declines in response to grazing, for the straightforward reason that less biomass is present (Steinman 1996). However, grazing can stimulate area-specific primary production under some circumstances. Possible explanations include taxonomic shifts, nutrient release by grazers, and reduced shading of the understory due to removal of the overstory. An increase in area- or biomass-specific primary production due to grazing is plausible because the removal of senescent cells should leave a greater fraction of vigorous cells, which have enhanced access to light and nutrients. Thus, while an increase in herbiv-ory is likely to cause a decline in periphyton biomass, cell-specific photosynthetic rates may increase. As a result, area- and biomass-specific primary production may be greatest under intermediate grazing pressure (Figure 9.4). In laboratory stream studies, McIntire and Phinney (1965) found that highest rates of photosynthesis were attained at low biomass, which they attributed to less shading and senescence. As a cautionary note, however, this effect may be exaggerated in laboratory streams, where initial colonization and rapid growth, followed by senescence and sloughing, are especially pronounced. Also using laboratory streams, Lamberti et al. (1989) observed stimulation of net primary production by grazing at low and intermediate but not high light levels, and for periphyton assemblages that had developed over months rather than weeks, which they attributed to taxonomic shifts, nutrient release by grazers, and benefits to the understory due to removal of the overstory. As attractive as this idea is, the evidence from a number of studies is inconclusive, at least in part due to difficulties in quantifying cell and biomass-specific rates (Steinman 1996). Herbivory on periphyton can alter rates of nutrient cycling, either reducing demand for nutrients because of lowered biomass, or increasing demand by stimulating the growth rates of grazed populations, and by altering mat characteristics and thus diffusion rates. Because levels of an enzyme produced by algae in response to phosphorus (P) limitation were lower in grazed than ungrazed assemblages, Rosemond et al. (1993) inferred that grazing reduced algal biomass to a level where the available nutrients were largely sufficient to meet algal demand. A much greater biomass of filamentous diatoms and cyanobac-teria accumulated in experimental streams when snails were excluded versus when present, with the result that P recycling was high within the ungrazed mat whereas P uptake from the water column was high under strong grazing pressure (Mulholland et al. 1994). The implication is that nutrient limitation may often increase as periphyton biomass increases, and that the dominant sources of nutrients may shift as periphyton mats accrue. Because primary producers and animal consumers, particularly herbivores, require nitrogen (N) and P to meet their growth needs, ratios of C/N/P in inorganic form and in producer and consumer biomass provide insight into nutrient constraints extending across trophic levels. Autotrophs grown under nutrient limiting conditions develop high C to nutrient ratios in their biomass, potentially resulting in nutrient constraints on consumer growth rates and affecting the rates and ratios of nutrients excreted and thus recycled back to the primary producers. The potential influence of nutrient constraints on trophic interactions is the subject area of ecological stoichi-ometry, discussed further in Section 11.3.3.3.